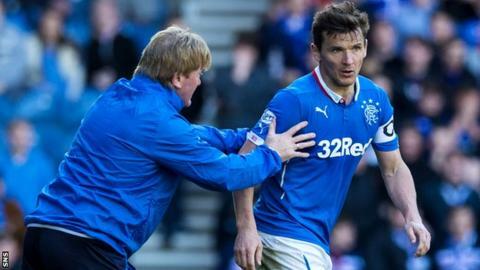 Rangers manager Stuart McCall was "sickened" by the Ibrox crowd's booing of Lee McCulloch during the Scottish Championship draw with Falkirk. The Light Blues captain was at fault for the visitors' second goal through Tom Taiwo, but the home side came back from 2-0 down to rescue a point. The result caused McCall's side to drop from second to third in the table below Hibernian, who beat Alloa Athletic. "It was very sad, and I was sickened to hear it at the time," said McCall. "What did please me was that, after a couple of minutes of it, the supporters then turned it on its head and drowned out the booing with claps. That's what we need as a club - togetherness. "It doesn't matter what has gone on last week, years ago, months ago, today. It's all about next week and the future. "The players will need the supporters as much as the supporters need the players." John Baird turned home Craig Sibbald's corner to hand the Scottish Cup finalists the lead before McCulloch conceded possession and Taiwo added a second. Haris Vuckic headed one back then Nicky Law kept his cool to calmly steer the ball through a crowded box and into the bottom corner in the fifth minute of stoppage time. "We put Lee up front near the end and he was denied a goal by another fantastic save from Jamie MacDonald," said McCall. "If he'd scored, I thought that would have been justice. "He is an experienced guy who has witnessed the highs and lows, but it's never nice to hear that kind of thing." Rangers face Hearts at Tynecastle in their final league game of the season, while Hibernian are away to Falkirk. The team finishing third will face Queen of the South over two legs to decide who meets the division's runners-up in the Premiership play-off semi-final double-header. The winner will then meet the team finishing second-bottom in the Premiership, again over two legs, with a place in the top flight the prize. "I think we got what we deserved in the end," McCall added. "To be two goals down with the time left and come back to level was pleasing. "It's a blow in terms of the league position, but we thought we would have to go to Tynecastle and win. We still have to do that. Obviously if Falkirk perform like they did today, Hibs will have it hard as well."